Let’s be honest here, we’ve all done it. Been going for that euphoric experience only to be disappointed and let down. That moment of panic and shame and then the sick feeling in the stomach as you stare at the results and think ‘What the hell will I do now’ and then, depending on who is home, a house full of rude words you’d never say in polite company. I had that recently while making my Lemon Overload Cake. The white chocolate I was using to cover up the pieced together outside of the cake seized. I thought I had done it right. I put the white chocolate in with the cream and put it over a barely simmering pan of water and as soon as the chocolate started to melt it seized. I have made ganache before. Lots of ganache and I did it wrong this time. My son and daughter in law married last year I made 90 individual banana sour cream cakes. Half were covered with dark chocolate and half with white chocolate ganache with chocolate shards topped with a hand made icing rose. I melted kilograms of chocolate and not one bit of it seized, what the #@$%. I should have reread the post about the litres of ganache I made then. The other thing that was different this time was the chocolate. For the wedding I used chocolate from a professional cake decorating shop. This time I just used supermarket chocolate. It wasn’t the cheap one though it was the good stuff. Basically, very basically, dark and milk chocolate is made of tiny particles of cocoa, sugar and cocoa butter. White chocolate doesn’t have the cocoa. If the particles mix with a liquid or steam after they start to melt they turn into a dull, dry, grainy mass. This is called seizing. Place cream, butter, sugar in a pot and stir over low heat until butter and sugar melts then raise heat and bring to a boil, stirring constantly. Place chocolate in a stainless steel bowl. When the cream boils pour over the chocolate. Let it sit for a couple of minutes and then stir until smooth. 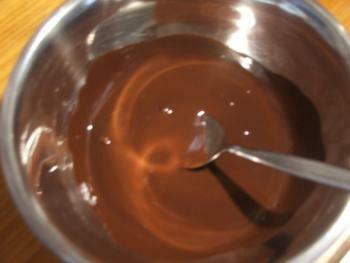 If the chocolate has not fully melted place bowl over a pot of simmering water and heat gently until it melts. After the chocolate/cream mix is smooth beat for a couple of minutes. Then spread over the top of the cake and let it run down the sides. While not vital if the ganache is refrigerated overnight then placed over a pot of simmering water and gently heated until smooth it will be much shinier than if used on the day it is made. This also means you can make sure it is thick enough to set. The first is that moisture has gotten into the chocolate after it has started to melt. Chocolate is a temperamental ingredient. The tiniest amount of liquid, just a drop of water or steam can give you a grainy horrible mass. Sources are varied and include wooden spoons, wooden spoons hold moisture; never use one in your melted chocolate.Another source of liquid can be when you are dipping fruit and it isn’t completely dry.Under no circumstances put a cover over your bowl of chocolate while it is on top of your double boiler. Any condensation that forms may get into the chocolate and seizing follows before you can blink.Be really careful while taking your bowl off the top of your double boiler too. I always turn off the heat first. The steam that escapes from the pot can burn you or make your chocolate seize. The second prime source of seizing is adding a liquid to your melted chocolate that is cooler than the chocolate. If you add cooler cream or milk for example. So if you are going to add liquids to the melted chocolate it must be the same temperature as the chocolate.Chocolate is extremely sensitive to rapid temperature change. Melting over direct heat is really risky. The safest way is in a double boiler. Things can still go wrong so some rules need to be followed.Care needs to be taken that the water in the bottom does not touch the top bowl. The water should be at a bare simmer not a boil. Choose a recipe. Chocolate that has seized is not good to use for coating or decoration it won’t have the same shine or delicate texture. Bu it can be used with other ingredients to make sauces, icings, ice cream or baked goods. For every ounce (30 g) of chocolate, you will need 1 tablespoon of one of the liquid ingredients from the chosen recipe. Butter, vegetable oil, water, milk or cream is suitable. 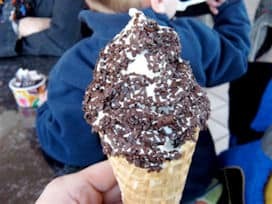 Water is often used in recipes that include chocolate, (See Chocolate Sauce recipe below) it is the way you use it that determines if the chocolate will seize or not. Do remember though sometimes you do everything right and it will still seize. If the seized chocolate has hardened, chop or grate it and put into the double boiler (if it hasn’t hardened just put it in the double boiler). Add butter, vegetable oil, water, milk or cream. Put it over the simmering water in the base pot of the double boiler. If the recipe calls for more than 1 tablespoon (per ounce or 30 grams chocolate) of whatever you are restoring the chocolate with that is alright you can use more. Just don’t exceed the amount. For example in the cookie recipe below I restored the chocolate by melting it with the butter. I then allowed it to cool to room temperature. 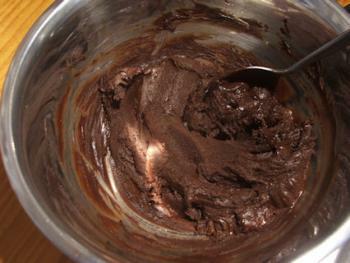 The mixture of chocolate and butter was around the consistency of soft butter. Then I creamed it with the sugar as I normally would for just butter. Do not allow the water in the bottom pot to touch the bottom of the top bowl or pot. Stir as the mixture heats and then whisk gently until smooth. You can slowly add more liquid if it is too thick but you should only use the amount of liquid in the recipe. For the ice cream recipe below I used the full amount of milk to restore the white chocolate, this was more than 1 tablespoon. The main point is not to use more than the recipe calls for. The white chocolate was restored with milk and the dark chocolate with butter. 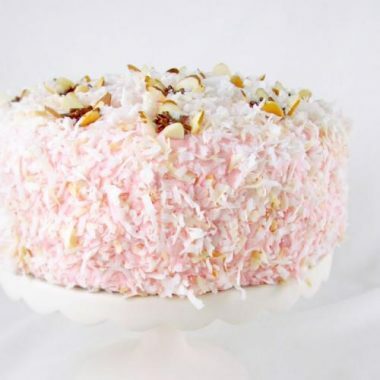 Recipe Source: These are my own recipes (except for the link to David Lebovitz’s German Cake). One of the things I learned at trade school was development of my own recipes. Any similarity to others work is coincidental or that the basis of my recipes is in a combination of so many recipes that I am claiming them as my own. David Lebovitz’s German Chocolate Cake is indescribably decadent and so wonderful I could rave about it for hours. The recipe calls for two types of chocolate – you can substitute your seized dark chocolate for the amount of chocolate in the recipe. I didn’t have the two types of chocolate called for when I made it so I just used dark chocolate and it was beautiful. I didn’t include photos there are plenty with the recipe. Cut or grate the chocolate and butter into small pieces. Place all of the ingredients in a double boiler over a low heat, stir continuously until all the ingredients have melted and blended together. As it cools it will thicken to a pouring consistency. This keeps in your refrigerator indefinitely. Chop the white chocolate into small pieces and put ½ to one side. Pour the milk into a saucepan stir in the cornflour until smooth. Place on heat and bring the pan slowly up to boiling point, let it boil a little stirring constantly. In a bowl, beat together the egg and sugar until thick. Pour the hot milk into the mixture of egg and sugar whilst stirring. 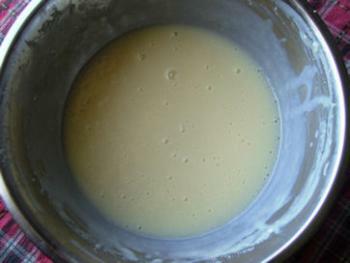 Pour the mixture back into the pan and heat gently, stirring until the custard thickens. Adding the cornflour stops the eggs curdling if the mixture boils and doesn’t affect the taste. Remove from the heat and stir in the vanilla extract and 1 portion of the chopped chocolate pieces. Keep stirring until all the chocolate has melted. Leave to cool. Whip the cream until it forms soft peaks. Fold the custard into the cream. Put the mixture into a bowl in the freezer and let it half freeze. 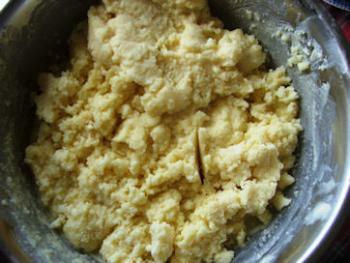 Beat it with electric mixer or put it into an ice cream maker. 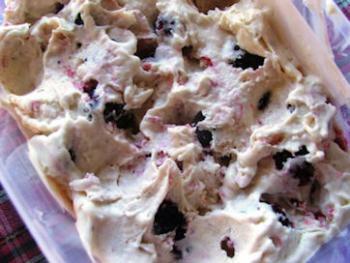 Fold the other portion of chocolate and 2 cup of fresh or frozen mulberries through the ice cream before it goes hard. Place in small molds or a loaf tin lined with plastic wrap. Freeze until solid and then turn out and slice if a log. Cream the butter, peanut butter, sugars, egg and vanilla until light and fluffy. Add the flour, soda and salt and beat well. Chill while making the chocolate. If you are using seized chocolate chop the chocolate and melt with the butter or if using chips just melt the chips; let this cool to room temperature. Cream the butter, chocolate, sugars, egg and vanilla until light and fluffy. Add the flour, cocoa, soda and salt and beat well. Chill for about 30 minutes. If you chill it too long it gets rock hard and then breaks up when you try to roll it. Roll out each half of the dough to roughly 10″ x 14″ (roll it on waxed paper and it will “behave” better when it is time to assemble). Flip the chocolate cookie dough (using the waxed paper to hang on to) over on to the peanut butter dough (or vise versa) and press together lightly; peel off the top waxed paper. Roll the two doughs together, jelly roll style, starting with the long side and lifting the waxed paper away at every revolution. 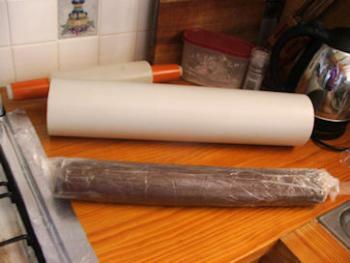 Wrap the rolled log of dough with waxed paper or plastic wrap and chill for half an hour before cutting. The cookie dough may be a bit soft from the handling, and it will either flatten a bit and/or it will get little ridges from the shelf. To keep the dough log round, place the wrapped logs of dough inside a piece of PVC pipe, lay the pipe on its side in the fridge this will help to keep the dough in shape. 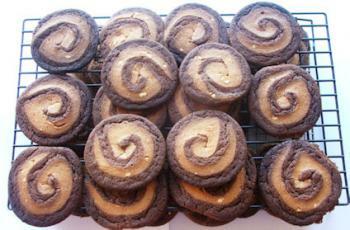 Alternatively lay the chocolate over the peanut butter dough and then cut into equal size pieces and layer. Chill really well, you can put it in the freezer for about 30 minutes. Slice cookies about ¼” thick and bake on a baking sheet lined with bake paper, in a 375°F/180°C oven for 10-12 minutes (watch carefully after 10 minutes). Let these cookies cool on the cookie sheet for about a minute before removing them. What Do They Eat In Denmark?